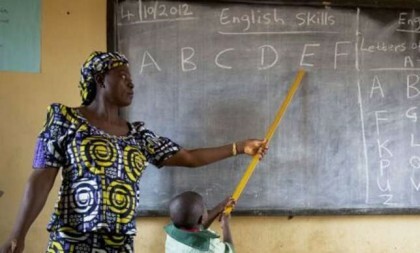 Mr Femi Ogunbona, the President of 1985-91 set of 62-year old African Church Grammar School (Afrograms), Abeokuta, however, disagreed that the retirement age of teachers should be raised from 60 to 65 years as canvassed by the Nigeria Union of Teachers and other stakeholders. Rather, Ogunbona said the government should attract youths to the profession to take over from old hands, who are retiring in droves. Ogunbona, an engineer, spoke with the News Agency of Nigeria (NAN) on Friday on the sidelines of a Prize-Giving and Spelling Bee Competition sponsored by the 1985-91 set of the school. NAN reports that the school has produced notable Nigerians including Ogun Gov. Ibikunle Amosun, and Mr Mutiu Adebowale, the Managing Director of First August Construction Company among others. The House of Representatives Speaker, Mr Yakubu Dogara, had backed increase in retirement age of teachers from 60 to 65 years to retain more experienced tutors in public schools. Dogara spoke when the national leadership of the Nigeria Union of Teachers (NUT) visited him in Abuja. Similarly, the NUT had demanded that the retirement age of teachers of primary and secondary schools in the country be raised from 60 to 65 years. Its National President, Mr Michael Olukoya, made the call at the 2017 World Teachers’ Day celebration in Abuja on Thursday with the theme: “Teaching in Freedom, Empowering Teachers’’. But Ogunbona said:“Rather than extend the number of service years for teachers to serve, government should make the profession more attractive and pay them appropriately. “Teaching profession is energy-sapping. For a 65-year-old, who has taught for over 30 years and we still expect a good output at that age, I do not think so. “If teachers are rewarded adequately, many young people would be attracted into the profession. Ogunbona said the set decided to reward the overall best student in WAEC and other outstanding students to spur other students to strive to attain excellence in their academic pursuit. In a goodwill message to the occasion, Mr Wale Olutayo, the National President of the Old Students’ Association, advised parents and guardians to place premium on the education of their children and wards. Olutayo, who was represented by the Vice-President, Mr Bayo Ogundimu, urged the 1985-91 set to sustain the tempo of the gesture and to make the Spelling Bee competition an annual event. In his remarks, the Principal of African Church Senior Secondary School, Mr Adetunji Elegbede, urged the beneficiaries of the award not to rest on their oars in their quest to acquire knowledge and skills in the school. He lamented what he called poor reading culture among students and advised them to study hard to pass internal and external examinations.